Disclosing secrets and releasing information poses high risks and personal costs and always takes a fair degree of courage. To expose an injustice, whistleblowers will have to trust who they are communicating with. Nonviolent politics has long recognised that societal institutions, even rigid hierarchies such as the police or military, are not monolithic, but are in fact riddled with dissent. Institutions are made up of individual human beings. Despite well-developed cultural, legal and bureaucratic mechanisms used to enforce internal obedience and discipline, whistleblowing and other forms of internal resistance are surprisingly common. 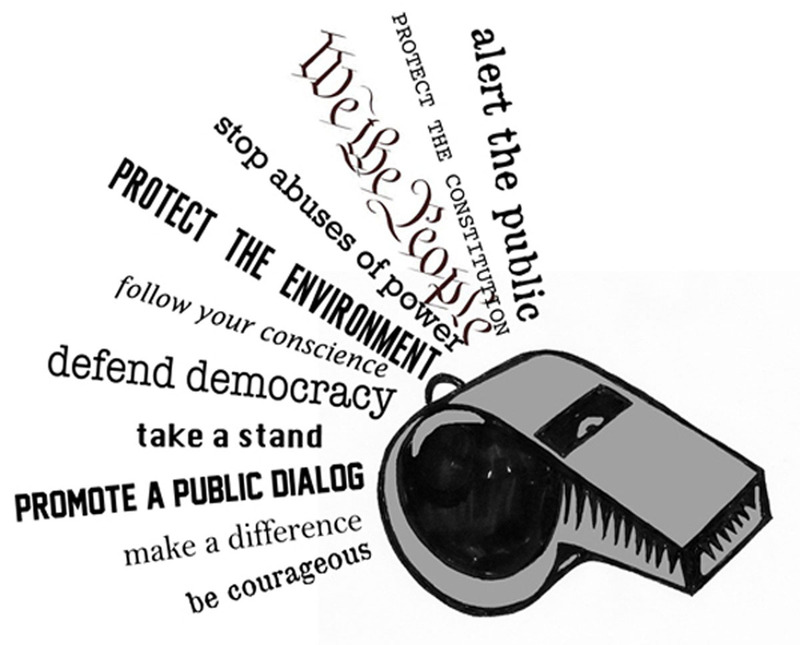 So, what can activists, organisers and movements do to encourage and support whistleblowers? 1) Don't alienate them! Avoid generalized public statements that are likely to deter whistleblowers from approaching you. "All cops are bastards" or "Everyone who works for Exxon should be charged with crimes against humanity" are likely to dissuade potential whistleblowers from trusting the movement enough to contact you. If the activist group or movement is perceived to be hostile, violent, unorganized or antagonistic then being approached by a whistleblower is far less likely. Targeting critiques toward management, government leaders or the decision-makers and not ordinary workers or the rank and file makes an approach more likely. 2) Send out invitations. Publicly address and encourage people within the institution to blow the whistle on unjust or illegal practices. Talk about ‘people of conscience’ within the institution. Actively and openly call upon people of courage and conviction within the ranks to tell their story. At rallies and public events engage with staff or rank and file workers to demonstrate that you are not hostile to them as individuals. 3) Communicate via leaflets, speeches, union newsletters, social media and via mainstream media statements, the message that you or the movement can be trusted to support and protect whistleblowers. Let them know that you are open to hearing from them. Don’t make promises you can’t keep but offer support when and where you can. 4) Create and promote avenues for interaction. Develop or utilize secure anonymous document drop links that you actively monitor. Develop activities or events that encourage interaction between the movement and staff. Organize a BBQ or dinner for staff, a public meeting for workers where they can hear about the movement. In Australia at Roxby Downs, anti-uranium activists held public meetings in the township to listen to the concerns of mine workers and their families. During the Vietnam War peace activists and Veteran groups set up G.I. Coffee Houses near military bases. The principle is the same; positive interaction generates trust and encourages internal dissent. 5) Prioritize and actively engage with any contacts. Potential whistleblowers will often put out subtle 'feelers' long before disclosing who they are or before releasing any information. They are seeking trusted contacts and testing you out. How activists respond to these initial contacts can be critical. Be open to communication that may appear suspicious at first or from dubious or anonymous sources. The general rule is to be respectful and courteous to all contacts as any one of them could end up being a critically important whistleblower. 6) If a potential whistleblower does make contact with you and identifies themselves in some way, make it a priority and do everything possible to ensure confidentiality. Drop other work if you need to in order to engage with them. 7) The risks for a whistleblower increase dramatically once they have made contact or gone public. Discuss with them what their fears and concerns are and help them conduct a risk assessment, which is essentially listing, discussing and then evaluating each identified risk. Seek out legal support for them that is capable of advising and advocating for them in the case of legal sanctions. Whistleblowers may be breaking contracts, agreements, regulations and laws in order to make information public. Form a small and capable support team around the whistleblower. 9) Security & protection. Work with your networks or activist group to provide as much support, security or protection as possible. In some cases this may mean making sure someone trusted is with them 24 hours a day for a while. This form of 'protective accompaniment' would mean creating a roster to have trusted people stay with the person and a protocol to alert more support if there is a threat or incident. 10) Ongoing support. Whistleblowers are often risking their safety, careers, incomes and reputations when deciding to release information on corruption or injustice. They will face damaging personal attacks and harassment, traumatic and long legal battles and possibly imprisonment. They deserve the ongoing and long term support of the movement. Some movements have set up ongoing support groups for whistleblowers that raise funds and generate public and political support. The Chelsea Manning Support Network operated for seven years and was able to cover 100% of Chelsea Manning’s legal fees throughout her court martial (nearly US$400,000) and mount a huge publicity campaign to raise awareness about her situation. Other groups like The Courage Foundation support several ‘truth-tellers’ internationally. The more support existing whistleblowers receive, the more likely others will follow. Whistle blowing poses a serious threat to power, privilege and the continuation of anti-democratic or authoritarian practices. Our movements grow stronger when we support them. Every bit of encouragement, support and protection you can provide is worth it. The Courage Foundation is an international organisation that supports those who risk life or liberty to make significant contributions to the historical record. They fundraise for the legal and public defence of specific individuals who fit these criteria and are subject to serious prosecution or persecution. They also campaign for the protection of ‘truthtellers’ and for the public’s right to know. Whistleblowers Australia Inc. is an association for those who have exposed corruption or any form of malpractice, especially if they were then hindered or abused, and for those who are thinking of exposing it or who wish to support those who are doing so. Anthony Kelly is and activist and trainer based in Melbourne, Australia and works on campaigns against racialised policing and for police accountability.